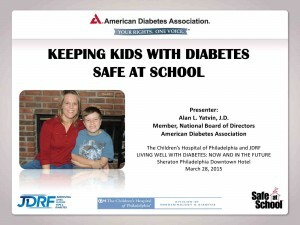 Alan’s session was entitled: Keeping Kids with Diabetes Safe at School. Attendees included parents, children with diabetes, healthcare providers, advocates and even a diabetes service dog in training. How parents can get support and assistance to protect the rights of their children with diabetes. A PDF of the PowerPoint slides, prepared by Crystal Crismond Jackson, Safe at School Director for the American Diabetes Association, is available here. Alan L. Yatvin is a partner in the Philadelphia law firm of Popper & Yatvin, where his practice includes representation of students and parents in special education and disability matters. Alan is a member of the National Board of Directors of the American Diabetes Association (ADA), and immediate past ADA national chair of Legal Advocacy. Based in Alexandria, Virginia, the ADA is celebrating its 75th Anniversary as it pursues its mission to prevent and cure diabetes and to improve the lives of all people affected by diabetes.